With so many options for Yoga Teacher Training these days, how can you filter through and find the best one for you? I often have people ask me to recommend a teacher training program- mostly new yogis or students who have practiced for a while but in the same location. They’re all looking to find the best training out there. When I trained over 10 years ago, I didn’t ask anyone. Why would I? The only place I knew that offered training was one of 3 yoga studios within 30 minutes of my house. And it wasn’t even Yoga Alliance certified, but then again very few were. And it really didn’t matter anyway – back then. But EVERYTHING has changed. Today, most studios are offering a teacher training program. And if they’re not already – the plans are in the works. It’s smart, it’s a great way to find new teachers for their studio, and it’s profitable. Prospective teachers have a buffet of options and choosing can be difficult. And there are many ways to find the right program for you, but the best advice that I give anyone is to visit the studio. Really – most of the time when someone asks me about a particular program, they’ve never even visited that studio. Teacher trainees look to spend just about every weekend over several months training, logging hundreds of hours at their “school”. Most will be taking additional classes in between these weekends, and many will be assisting and apprenticing there. HOW CAN YOU NOT VISIT THE STUDIO FIRST? Do your research online. You can get a general overview of what the programs are like and check out the backgrounds of the people leading the training. Choose a handful that will work for you. Consider the training schedule, cost and location. It needs to be accessible for you. Ask yourself if you enjoy the type of yoga the studio is offering. If it is an Ashtanga-based studio, you can be sure the training will have a strong Ashtanga influence. If you don’t care for Ashtanga, then cross it off. Take a class. And try to take a class with the owner, or the person who is teaching the training. Feeling connected to your teacher/trainer is essential. If you liked the class, take another one. Then ask yourself: Did you feel welcome? Did you love the practice? Did the teacher deliver what you expected? Do you want to spend hundreds of hours at this studio over the next year? Then I think you’ll have your answer. 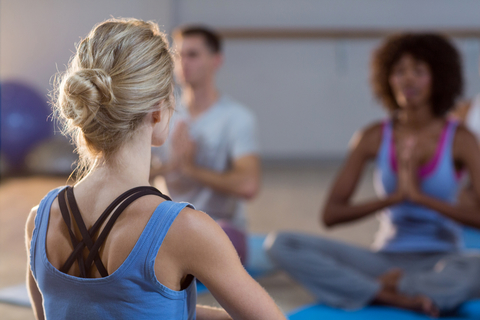 Have any great tips on finding the most appropriate yoga teacher training? Please share below.